Why: Early in February 2016, Giulio Regeni an Italian PhD student at Cambridge, was horrifically murdered while doing field research in Cairo, Egypt. Giulio disappeared on 25 January, in the midst of a huge security crackdown aimed at preventing protests on the anniversary of the 2011 revolution and his body was found 9 days later by the side of a highway, with signs of torture that led to his death. Giulio was researching the work of the independent trade unions in Egypt, which have been frequent critics of the authorities and effective community mobilisers. According to the Egyptian Commission for Rights and Freedoms, over 400 cases of ‘enforced disappearance’ cases have been documented in Egypt since August 2015. In many of these cases, young people end up illegally detained by the state, sometimes dying of torture. Giulio’s mother rejected claims by the Egyptian authorities that her son’s death was “an isolated case”. The Italian government has taken diplomatic action to try and force the Egyptian authorities to cooperate with the investigation into Giulio’s murder by withdrawing the Italian ambassador from Cairo. Yet the British government has only expressed regret and called for a “full and transparent” investigation, despite the fact that Giulio was a student at Cambridge and a resident of the UK for ten years. 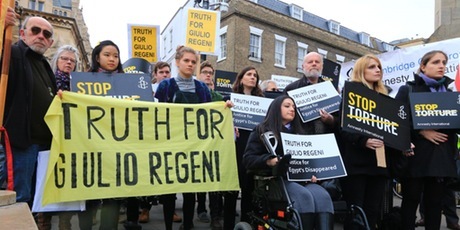 Amnesty International’s campaign for “Truth for Giulio” is led by Amnesty Italy and in the UK by the Amnesty Cambridge City and Amnesty Cambridge Student groups. This rally and vigil is a collaboration between Amnesty UK and the University and College Union UCU, the School of Oriental and African Studies UNISON branch, and Egypt Solidarity Initiative.